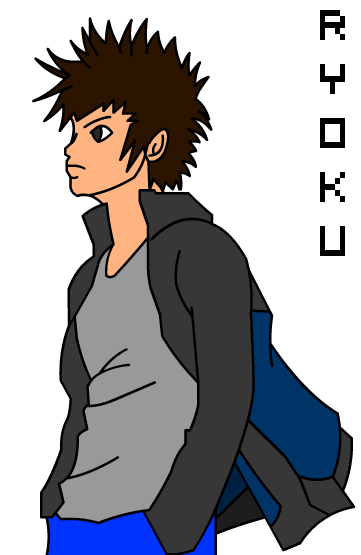 Personality: Ryoku is a very clever ninja that likes to think before acting. He respects every ninja in his village even if they are the enemy. Ryoku never under estimates anybody. He has amazing speed, and is able to move around a battlefield in the blink of an eye. He specializes in ninjutsu lightning moves (Raiton) and his taijutsu is fair. He also uses swordplay in his fighting style. History: Ryoku was born in the Village Hidden in the Clouds under the Ikazuchi clan. His parents were both skilled powerful ninja. His mother was a Medical Ninja while his father was a Hunter-nin. Both were always away on missions so Ryoku has learned to take care of himself. Ryoku developed his clans kekkei genkai (Shinkansen) at a very early age. While in the ninja academy Ryoku didn't make many friends but graduated rather quickly. As a Genin, Ryoku completed many difficult missions and became a Chuunin on his second try of the Chuunin Exams. As a Chuunin, Ryoku trained his swordsmanship under the Raikage. After his 3 year long training he was appointed as an ANBU for his ninjutsu and sword skills. A few months later the Raikage at the time became ill and died, the village elders then appointed Ryoku as the new Raikage. Weapon Ability: The katana once belonged to Ryoku's father but was given to him when his father was killed. Some who have faced Ryoku say that he changes personality when he uses the katana. Ryoku can manipulate his chakra in to his sword to make lightning clouds appear and disappear. Description: The user holds his/her arms away from his/her body, claps his/her hands (fingers pointed towards the target) and a bolt of lighting shoots from the tips of his/her fingers. Multiple can be shot if fired in succession. Description: Using the Shinkansen and lightning chakra, the user is able to shoot a sharp bolt of lightning out of their fingertip at a precise point on an opponent's body. For example, a precise shot can be used to disrupt the flow of the nervous system. Description: This jutsu is a complicated one, and the user must have really high lightning element knowledge. The user preforms the hand signs, and then creates a tiny electrical ball on his hand. The user will then send a strike of lightning to the opponent and paralysis him/her. Description: The user takes his sword and holds it firmly in the air. The user then concentrates natural lightning chakra into the sword. The user then attacks in a complicated sword-dancing pattern to confuse the opponent. Despite the complexity of the move the actual resulting attack is rather anticlimactic. Description: The user uses his lightning chakra to form a dragon capable of ripping through solid stone. Once the dragon is summoned it can only go in a straight line, so it is evadable. It is also one of the few lightning techniques that is immune to the earth and sand elements. Description: It's basis is the Chidori and as such it's hand signs are the same, After performing the Chidori the user needs to have perfect chakra control and Shape Manipulation to move the lightning based chakra up to their for arm where it will take the shape of an extremely durable shield. Description: It's basis is the Chidori and as such it's hand signs are the same, After performing Chidori the user needs to have perfect chakra control and Shape Manipulation to move the lightning based chakra all over their body and it takes the shape of a knight armor and is extremely durable. Description: The user uses their natural electric pulses to increase the speed of messages in the body causing the body to heal faster. An advanced form of this jutsu allows the user to convert the electricity around them into stronger electrical pulses which can increase the healing factor and on some occasions absorb the electricity around them and converting it to chakra that the user can use. Description: Change of Body Stance Technique is a basic Ninjutsu technique. When in danger the ninja will quickly substitute themself with another nearby object. This can be a block of wood or even another person. This allows the ninja to quickly flee and hide while the original object takes the brunt of their opponents attack. Description:This jutsu is a high-speed movement technique, allowing a ninja to move short to long distances at an almost untraceable speed. To an observer, it appears as if the user has teleported. A puff of smoke is occasionally used to disguise the user's movements. It is accomplished by using chakra to temporarily boost the user's reflexes. The amount of chakra required depends on the overall distance between the user and their intended destination. Description: As the ninja charges at his opponent, he creates multiple shadow copies to confuse his opponent. Using the confusion, the real ninja will attack from the opponent's blindside. Description: This technique appears to be similar to the shadow clone technique, with the exception that after the clone has been destroyed the body will disperse into a flock of crows, which can continue to speak and maintain a physical form. Description: The user channels electrical chakra into his swords to increase their cutting power. By doing so, his swords are sharp enough to cut through the Decapitating Carving Knife. Description: A variation of the Shadow Clone that creates a clone made of Lightning Chakra. 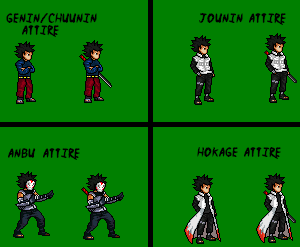 As a shadow clone, the clones are capable of attacking, using jutsu, etc. However, instead of disappearing in a puff of smoke when destroyed, it can electrocute the opponent. Unfortunately, as pointed by Kakashi Hatake, this technique requires a great expenditure of chakra. Kakashi has mentioned that this jutsu is equal to half of his chakra. Description: By manipulating lightning chakra into the dominante hand, the user make the lightning expand to can create the form of a hound. to attack his opponent from a distance. The lightning dog will still be connected to the user’s hand through a bolt of lightning. The user then manipulates the technique to attack the chosen target. Being a Lightning Release, it requires a lot of chakra from the user to maintain for a period of time and thus a risk to use with a low chakra supply. Description: This is a jutsu in which the user focuses precise chakra control into their hands or feet to greatly enhance their strength. Description: Allows the user to move himself to another location in the blink of an eye. Although it is often compared with the Body Flicker Technique, the speed of this jutsu is much greater. In principle, this jutsu is similar to the Reverse Summoning Technique, as it revolves around manipulation of time and space rather than accelerated movement, but instead of bringing something to users, it sends them somewhere. Additionally, it makes no noise and produces no puff of smoke, allowing the user to appear behind someone unnoticed. Description: By drawing his sword, the user can send an electrical essence into the clouds, allowing him to create lightning strikes in any desired location. Description: By gathering chakra between his sword, the user can create a ball of electrical energy and launch it at the enemy. Description: By raisng his sword over his head and spinning it in a circle, the user can use this jutsu to surround himself with electricity. The intense electric field protects him by electrocuting anyone who makes contact with it, but only works for one attack. Description: This technique lets the user create a three-sided wall of electricity to bind their opponent. The user must have three conductors to stick in the ground to create the points. Furthermore, once the enemy is inside, if they come into contact with the wall they will be electrocuted. The only way the jutsu can be broken is if an outside party were to strike one of the wall with a strong enough attack, which will then deactivate the other walls. Description: The user can teleport his target anywhere within a ten mile radius. Description: A jutsu that allows the user to transform their skin into an element.He/She takes a fourth of their elemental chakra and stores it into,well, all over. Description: The user places his hands to the ground after converting their chakra to lightning. The user then sends an enormous bolt of lightning that cuts through the ground towards the target. The shape of the bolt is a triangular figure with the base in front of the user and the tip headed towards the opponent. It causes devastating destruction on its way and generates with enough heat and power to destroy whatever it comes into contact with. Description:This technique lets the user summon lightning from the sky to their hand and then shoot it at their opponent. Description: The Shuriken Shadow Clone Technique allows the user to create shadow clones of a shuriken to attack an opponent. The user throws a single shuriken and use the technique to create multiple shadows clones of it, giving the user more chances to hit the target and also giving the user an advantage by catching the target off guard from the sudden increase in number. Description: Before a summon can be performed, a prospective summoner must first sign a contract with a given species. The contract can come in the form of a scroll or a tattoo. The summoner then signs the contract in their own blood. After this, they need only perform the hand seals, offer an additional donation of blood, and use the same hand they signed the contract with to summon the creature. The amount of chakra used during the summoning determines how big the summoned creature can be. It should be noted that anyone can summon the animal as long as they have the blood from someone who has made a contract, along with sufficient chakra of their own. When an animal is summoned it is transported from its place of residence to the summoner's location. Once summoned, the animal can perform a task or help the user in battle. The summon is not required to help the user, and may be more of a hindrance than an ally. In addition, summons are able to summon their summoner. They may also wear a forehead protector, suggesting a loyalty to only one village. Description: The counterpart of the Summoning Technique, this jutsu allows an animal to summon humans that they have a contract with. Description: Kirin is an extremely powerful, one-shot lightning technique that strikes in the blink of an eye. The user draws lightning directly from thunder clouds to supplement the power of his or her strike, and controls it with chakra. Because the technique uses natural lightning as opposed to elemental chakra, its power easily outmatches all other Lightning Releases. However, the preparation time required also decreases the technique's efficiency.